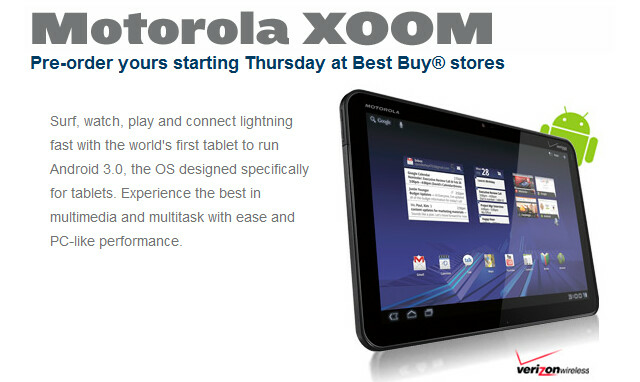 Best Buy to begin Motorola XOOM pre-orders this Thursday at a price of $1,199? Best Buy's online site sure got a lot of people up shaken up this morning when it showed a price of $1,199 for the Motorola XOOM. That price is about $400 more than what has been expected. First, let;s get to the main point of the story-Best Buy is expected to start taking pre-orders for the Honeycomb flavored device starting this Thursday. As far as the price is concerned, the $1,199 is most likely a placeholder, used by the big box retailer to keep its actual price looking a little more realistic. Best Buy did confirm that one month of data will be necessary if you are planning on buying the XOOM through the retailer. And for those who might have forgotten, the Motorola XOOM certainly has some high-end specs such as the dual-core processor and the tablet-optimized Android 3.0 under the hood. 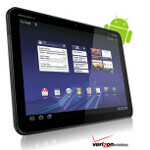 The XOOM will launch as a 3G device, but will be upgradable to Verizon's 4G LTE network. The device offers both front and rear facing cameras with HD video capture. The $1,199 price point does seem out of place as at no time since the tablet was first discussed in the media was there talk of such a price for the Motorola XOOM. The placeholder theory seems much more likely. And it really isn't such a bad tactical move by Best Buy because if they do introduce the device at a lower price-say $799-it will make that price seem like a great bargain when compared to $1,199. Comment got cut off, was supposed to say " = less than $1200". Wtf yo. I was almost positive that id pick this up when it released, but for 1200! It disturbs me that people think paying that much for a tablet is acceptable. 5 things I could do with 1200. 1.get a complete new wardrobe 2.purchase a cheap car (with plenty of gas money) 3.wait and buy any of the dual core phones coming out and pay my bill for months. 4.buy brand new alien ware computer or 1080p 3d tv 5.or just make it last for weeks. Motorola please don't do this to us. 700 had me thinking about it but 1200 lost me. Samsung Galaxy Tab II just became so much more attractive !!! $1199, Motorola can forget it. I was honestly gonna buy, but not for $1200. I can get a nice powerful Laptop for that kind of money. Sorry Moto but you just screwed up on this in regards to price. I wonder if the $1,200 includes a year of unlimited data at no additional charge? If it is $1,200 plus data charges, Samsung is going to do quite nicely with their 10 inch tablet. Even RIM might benefit from the price. I sure hope Moto hasn't let success get to their heads, 'cause they aren't going to sell many Xooms if the price is $1,200 plus data fees. this will be dead in the water if it launches at that price. You would have to be a real tard to buy this for 1200$ when you can buy a great laptop that would blow this thing away. Of course, people buy Ipads so I may be mistaken.